Crazy about your beloved pet? 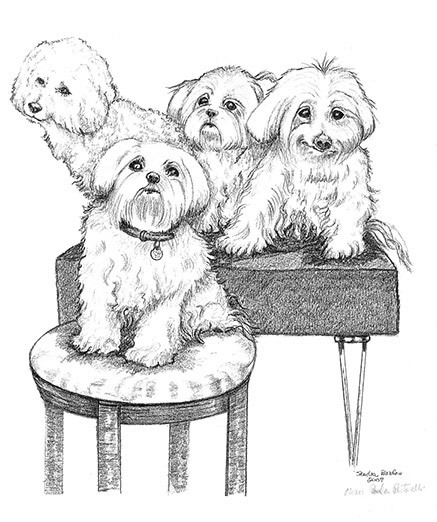 Send Sandra Bordes a photograph and she will capture your pet's personality and beauty in a one-of-a-kind, original pencil drawing! Portraits are done on archival quality, acid free paper, matted and ready to frame. Makes a great gift for the pet lovers in your life! Note cards from your pet's portrait. Breed request accepted. If you would like a breed, package, or portrait not described above, please call 978-487-7154 or email Sandra at SandraBordes@att.net with your specifics. Sandra Bordes has been drawing and painting since she was a child. She has studied in art schools in Connecticut, Rhode Island and Massachusetts. Her studies include animal portraiture, fine art, graphic design and children's book illustration. Her work has been exhibited and sold throughout New England. Sandra's heartfelt affection for animals shines through each and every portrait she creates!